How crazy everything has been! I am sorry that this is the first post this week, but as it was a holiday earlier in the week, I’m sure you’ll forgive me. Right now my hands smell like lavendar thanks to the fabric softener that I just threw together… We will see how much I like it once the clothes have dried from waving in the wind. (I have a goal of hanging more laundry out to save money by not using the dryer as much but I abhor stiff clothes and towels.) I’ll let you know – and share with you what all I did to make it if it ends up being worth it! ha. Next for today is to clean the kitchen – how does it get dirty so fast? – and then make some strawberry jam. Yum! True Honor (book 3) by Dee Henderson – last book of the Uncommon Heroes series. I think this is my favorite of the three. It is intense as its’ storyline deals with the September 11th attacks. Darcy St. James is a CIA officer gathering intelligence on the men profiting from the attacks. Sam “Cougar” Houston is a Navy Seal whose team gets deployed based on the information Darcy gathers. During this war, their romance flourishes. But then they find out that Darcy’s name is high on the terrorists’ hit list. I adore Darcy. She’s tough, gives her all and yet is overwhelmed and exhausted of keeping it all together. The Heartache No One Sees by Sheila Walsh – I must admit, I don’t think I’ve made it even halfway through this bible study book. It is good, but it isn’t turning out to be quite what I wanted. It is interesting learning more about Sheila Walsh – as she has her personal story in each chapter. This book is to help women with broken hearts from their past learn to accept Christ’s healing and acceptance. It is very well written, my disappointment with it has nothing to do with the actual book. Like I said, it’s more that I was searching for something else. In Sheep’s Clothing by Susan May Warren – Gracie Benson is on the run – from the man who murdered her best friends. The man trying to keep her alive, an FSB agent, is haunted by mistakes of the past, and intent on catching the man who ruined his father’s life. What Gracie doesn’t know is that she carries a medical secret that in the right hands, could save millions. Outwitting the Russian old guard with a small group of friends is the only way to save Gracie’s life. ACK! I love love love this book. This romantic suspense, has everything you want in a novel! The Shadow of the Bear by Regina Doman – This is a modern retelling of the Brother’s Grimm fairytale, Snow White and Rose Red. I must admit that I forgot how much I enjoy this book! Bear, a rough and mysterious young man shows up on Blanche and Roses’ doorstep. While the sisters’ opinions on him are opposite, he becomes their closest friend in New York City. But Blanche’s fear that he was putting her family in danger, become horribly real and they must fight for their lives. (!!!) This book is a must read! I got this years ago from a dear friend and it has become a yearly read for me. The Belly Off Diet by Jeff Csatari – I got this book from the library to try out some new recipes. It’s actually from Men’s Health, and is interesting reading. It’s got a quick-start 7 day program – recipes, workouts, etc – that is proven and says that you will see results within days. The exercises don’t require a gym (always a plus!) and the meal plan isn’t one that leaves you full at the end of each day. It’s full of REAL food – spaghetti, chicken wings, pizza, taco salad, etc. I’ve tried several already and plan on keeping them in my ‘repetoire’! For anyone looking to lose that stubborn stomach weight but hate the gnawing on your insides because the portion sizes are too small – check this book out! 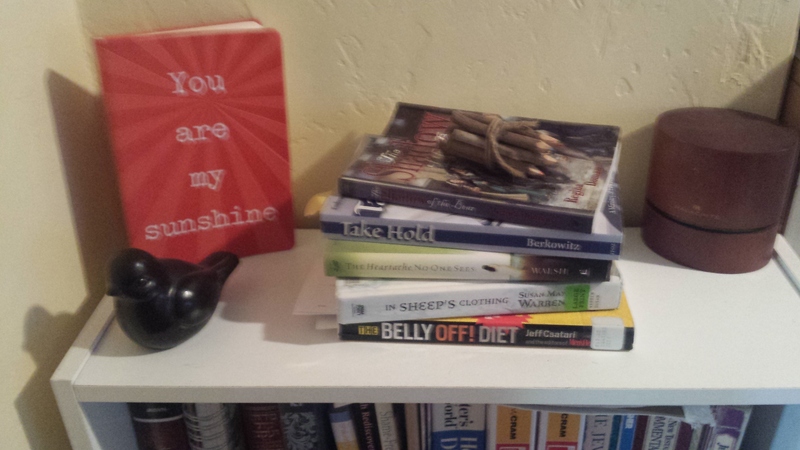 I already have a list of books to read this coming month – some from the library, some from my own shelf! Including – but not limited to – Finding Betty Crocker, A Tiger in the Kitchen, Fast, Fresh and Green, A Beauty so Rare and finishing Take Hold. I do want to read the Anne of Green Gables series, but not sure when I’ll start that! Happy reading friend and I’ll talk with you next week! ← The Garden has been Started…unless the seeds are duds. I love LOVE that you mentioned hanging clothes on a clothesline. 😀 we found an adorable little house that we’re moving into on August 1st and it has a great yard–so I’m thinking clothesline! I love how fresh clothes smell after a few hours drying outside. I love the fresh smell – and i’ve learned that if you toss them in the dryer for a bit afterward, they are still comfy soft! =) I’m so excited for you getting into a house! you’re gonna have so much fun. I recommend KIDNAPPING THE LORAX by Patricia Lichen; all of the books by Lisa Nowak (not the astronaut); books by Alice Lynn; and books by Barbara Froman also uses name of Kris Knorr–hers are soooo funny! All authors I know! Oh, and poetry books by Paulann Petersen, Oregon’s own Poet Laureate and a dear friend of mine!